The ArrayFire library offers JIT (Just In Time) compiling for standard arithmetic operations. This includes trigonometric functions, comparisons, and element-wise operations. the variable is required for the computation of a different variable that is not-JIT supported it. When the above occurs and the variable needs to be evaluated, the functions and variables in the AST data structure are used to create a single kernel (''function-call''). This is done by a creating a customized kernel on-the-fly that is made up of all the functions in the AST - the customized function is then executed. A reduced number of kernel calls - a kernel call can be a significant overhead for small data-sets. Better cache performance - there are many instances in which the memory required by a single element in the array can be reused multiple or the temporary value of a computation can be stored in the cache and reused by future computations. Temporary memory allocation and write-back can be reduced - when multiple expressions are evaluated and stored into temporary arrays, these arrays need to be allocated and the results written back to the main memory. Avoid computing elements that are not used - there are cases in which the AST is created for a variable, however the expression is not used later in the computation. Thus, it evaluation can be avoided. Better performance - all the above in fact can help reduce the total execution time. // As JIT is automatically enabled in ArrayFire, this version of the function forces each expression to be evaluated. // If the eval() function calls are removed, then the execution of this code would be equivalent to the following function. The above code (using ArrayFire) computes the value π using a Monte-Carlo simulation where points are randomly generated within the unit-square.Each point is then tested to see if it is within the unit-circle. The ratio of points within the circle and the point in the square approximate the value π. 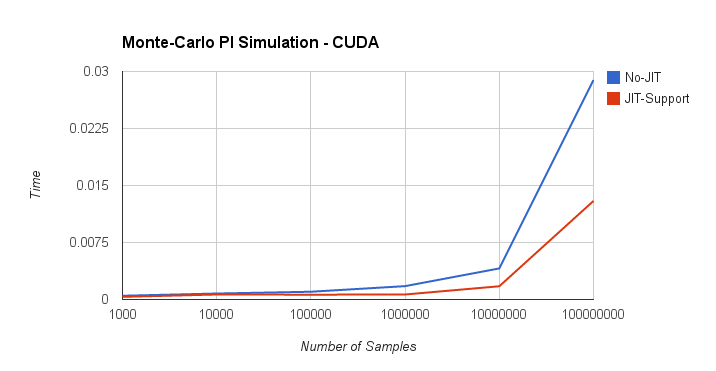 The accuracy of π improves as the number of samples are increased, which motivates using additional sample. There are two implementations in the code listing: - an implementation that takes advantage of the JIT feature (pi_jit) - an implementation that does not benefit from the JIT (pi_no_jit). Specifically, as JIT as an integral feature of the ArrayFire framework, it cannot simply be turned on and off. The only way for a programmer to side-step the JIT operations is to manually force the evaluation of expressions. This is done in the non-JIT supported implementation. The above figure depicts the execution time (abscissa) as a function of the number of samples (ordinate) for the two implementations discussed above. These tests were conducted on NVIDIA K20 GPU. When the number of samples is considerably small, the execution time of the non-JIT supported function is dominated by the launch of multiple kernels. While the JIT supported function only has a single kernel to launch, the creation of the JIT-code dominates the execution time. Nonetheless, the JIT supported function is 1.4X-2.0X than the non-JIT supported function. In the case of the large number of samples, both the kernel launch overhead and the JIT-code creation, are not the limiting factor - the execution time is dominated by the functionality of the kernel. Specifically, the JIT supported version is 2.0X-2.7X faster than the non-JIT support function due to the reduced number of cache-misses. The number of applications that benefit from the JIT code generation are large. The actual performance benefits are also application dependent though we have a seen similar performance curves in the past.In a recent blog, Conway's Game of Life, we showed how to implement the "Game" in a handful of lines of code. Now that you know about the JIT and what to look for, can you see how JIT is applied to the Game of Life?